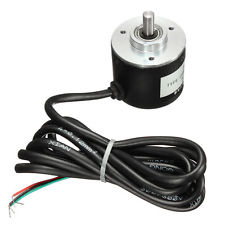 I purchased one of these optical encoders on Ebay a while back for about $12. It gives 400 pulses per revolution and no contact bounce. It’s much too fast for the Arduino program as-written to keep up with, so I had to completely re-write the encoder code to use interrupts. It works a treat and no need for the annoying speed-up algorithm that makes the uBitx so hard to tune. With step size set to 50 hZ, you get a nice smooth 20 khZ per revolution of the knob. I have a front panel drilled and cut to accept this and the TFT color touch display. I’ll be unveiling both in the cabinet along with the uBitx, possibly this weekend. It looks like the picture in my previous post.